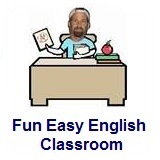 ﻿ Fun Easy English - new classroom free online classes english language lessons speaking listening writing reading december 31. Today you are going to learn about New Year's Eve an important holiday celebrated worldwide. In the Gregorian calendar, New Year's Eve (also Old Year's Day or Saint Silvester's Day in many countries), the last day of the year, is on December 31. In many countries, New Year's Eve is celebrated at evening social gatherings, where many people dance, eat, drink alcoholic beverages, and watch or light fireworks to mark the new year. Some people attend a watchnight service. The celebrations generally go on past midnight into January 1 (New Year's Day). New Year's Eve is traditionally the busiest day of the year at Walt Disney World Resort in Florida and Disneyland in Anaheim, California, where the parks stay open late and the usual nightly fireworks are supplemented by an additional New Year's Eve-specific show at midnight. Everyone in the world celebrates New Years Eve differently. Do you wonder what they do in America? The following videos are from the most famous New Years Eve show in the world held annually in New York City. Hey I was planning on making a test for the classroom lesson today but nobody is going to do it anyway. Hey who studies on New Years Eve? I decided it was simply better to say a few words. Fun Easy English has taken over 16 years for me to make. I love teaching English and learning other languages. I know as a teacher and as a language student it is often difficult to find good study materials. This is why I created Fun Easy English and especially the classroom. I wanted to make a place where English language students could go and study for free, anytime and anywhere. Hopefully these lessons were useful to you during the past year. I want to thank those of you who made such nice comments throughout the site. This was a lot of effort and knowing this site provided some benefit in this world is the best payment I can receive. Anyway, I know you are all busy tonight but I simply wanted to say the following. Please learn to accept each other regardless of color, religion, language, culture, etc. We are all part of humanity and need to appreciate our differences. Yes English is very important but it is the diversity of language and culture that makes this world a wonderful and interesting place. As always thank you very much for visiting and good luck with your English language studies in 2020. My name is Akiko Hayman. Howie is my husband. I am still learning English from him. I made a cooking site in English. You can learn Japanese recipes. Please visit when you can. My name is Shai Hayman. Howie is my dad. I am 4 years old. I am teaching English to kids now on my own site. It is very cool. You can see my cat and my puppies. Please come and say hi and write a comment.